For this young man, listening to his sister was a good idea. Joining his local Farmers’ Hub was even better. And vegetables may one day even pay for two medical degrees. Razzakul Islam grew up in Kachabari, a village in northern Bangladesh. He was one of many siblings, and did not inherit a personal share of land. Every day he would work in his father’s field and dream of cultivating his own. A few years ago, ‘Razzak’ visited a sister a couple of hours away. He told her he was frustrated by the low yields of the previous season. He had only earned 12,000 taka on 33 decimals of land (about $140 from 0.133 ha). His sister then shared her family’s ‘yield secret’. She told Razzak about highly resilient soil-less seedlings bought from the local Farmers’ Hub (FH*). He was really impressed, and went there at once. There he discovered that the FH does not only sell quality seedlings. It also trains farmers on cultivation of specific crops, rents out modern machinery, and runs a selling platform for harvests. Razzak became very keen, and got seedlings and machinery from the Hub. That season, his yield increased by 30% and his income trebled. He thought how much more profitable it would be if he had his own land, and if there were a FH nearby. Fortunately, in late 2015, a FH opened in Razzak’s sub-district. “I realized that I could finally begin walking towards my dream”, he remembers. He borrowed 20,000 taka from BRAC**, and took a mortgage on 25 decimals right next to the Hub. When challenges came up in the field, Razzak asked for further advice. After harvesting, he sold his produce to the FH. His first crop bagged him 55,000 taka. He invested the profit in a further 50 decimals, and has continued to add land since then. “Today I have a mortgage on 250 decimals. 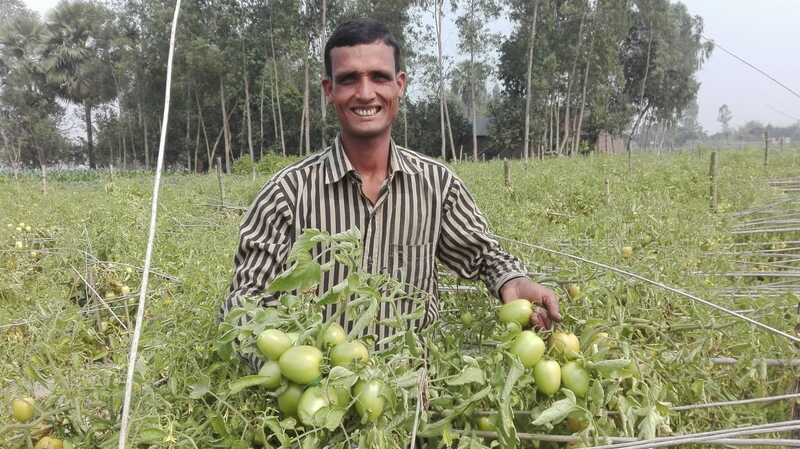 On about two-thirds of the land, I grow brinjal, cucumber, tomato and bottle gourd in turn.” Razzak’s yields are 30-40% higher than non-FH members’, and his income is a similar margin ahead. He now makes between 175,000 and 200,000 taka profit – at least 14 times what he used to! These new earnings have enabled Razzak to open a grocery store. “The shop brings me another 5000-6000 taka per month”, he reports. Razzak has also added one room and a bathroom to his house. Inspired by his success, about 20 neighbors have started vegetable farming, with FH guidance and seedlings. The Farmers’ Hubs program started in Bangladesh, and is now spreading elsewhere. The hubs offer multiple services to local farmers. Each is designed to run as a profitable business, and also boosts its clients’ income. visit our Farmers' Hub page.